Scanning people in 3D to print out their figurines and busts is quickly gaining traction worldwide, but one company has taken the idea a little further, making a 3D printed bust radiate soft bluish light for artistic effect. It started with a call from one of the oldest European theaters, Burgtheater, to VirtuMake, our Vienna-based partner. In Austria there aren’t all that many 3D printing companies that can offer the kind of services VirtuMake does, so when it comes to finding a 3D printing solution within the country, many people go straight to them. “We help our customers get high quality 3D data from almost any real world object,” says Mayrhofer. “Then we modify this data and produce it using a wide range of 3D printing materials like plastics, metal and ceramics.” VirtuMake sells Artec 3D scanners and helps its customers learn how to use 3D scanning and 3D data modeling to get the most out of their investment. So VirtuMake got down to work. They first used Artec Eva to scan Peter Simonischek’s head. This took just two minutes to complete. They then scanned a Roman bust and merged Simonischek’s head onto it via 3D modeling software. Prior to 3D printing the newly created bust, the inside was hollowed out in order to save on 3D printing materials. Once the transparent head and the white bust were 3D printed, they were glued together and ready for display on stage. LED lights were placed inside to provide for a very unique glowing look. As you can see in the photo provided by VirtuMake, it came out quite well, looking almost as if carved out of ice. What do you think about VirtuMake’s use of 3D printing and scanning to create this unique one-of-a-kind bust of actor Peter Simonischek? Discuss in the Burgtheater 3D printed bust forum thread on 3dprintboard.com. 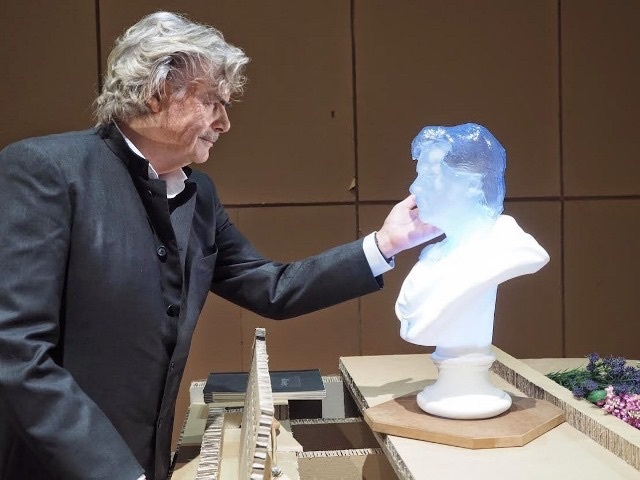 Based on the story Austria’s Most Famous Theater Has Incredible 3D Printed Glowing Bust Created of Actor Peter Simonischek written by Whitney Hipolite for 3DPrint.com.